One of the largest young craters on Mercury, 114 kilometer (71 mile) diameter Hokusai crater’s bright rays are known to extend across much of the planet. But this mosaic of oblique views focuses on Hokusai close up, its sunlit central peaks, terraced crater walls, and frozen sea of impact melt on the crater’s floor. 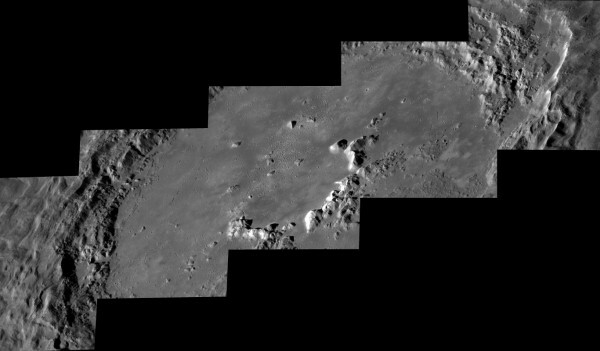 The images were captured by the MESSENGER spacecraft. The first to orbit Mercury, since 2011 MESSENGER has conducted scientific explorations, including extensive imaging of the Solar System’s innermost planet. Now running out of propellant and unable to counter orbital perturbations caused by the Sun’s gravity, MESSENGER is predicted to impact the surface of Mercury on April 30.